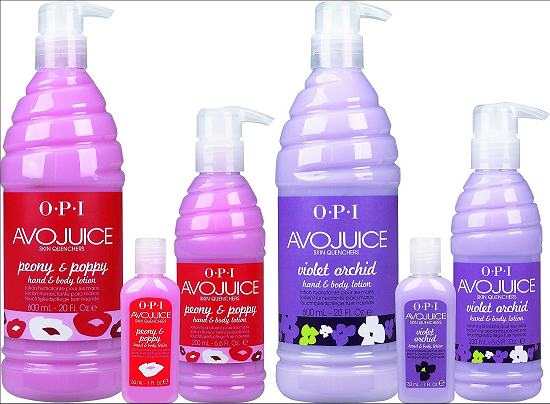 OPI launches two new Avojuice Skin Quenchers Hand & Body Lotions in floral scentsPeony & Poppy and Violet Orchid. Inspired by nature’s sweet smells, these nourishing formulas feature a blend of exotic flower fragrances. Both new Avojuice lotions incorporate avocado and aloe extracts to leave skin silky smooth and hydrated, while the deep floral fragrances of Peony & Poppy and Violet Orchid are designed to awaken the senses. These are due for release in July i think…i don’t know about you but i’m really excited to try out these new scents! I always have a mini size with me and i think all of the scents smell wonderful. My favourites are Coconut and Melon and Peach. At the moment i’m using Peach and it’s a lovely light fresh smell. I think what makes these so popular is how light and quick to absorb they are. A lot of hand creams can be quite greasy and thick- something AvoJuice really isn’t! Really looking forward to these being released, and as soon as they are i’m gonna snap up a mini bottle of each to try and review!